The War on Drugs is an American indie rock band from Philadelphia, Pennsylvania, formed in 2005. 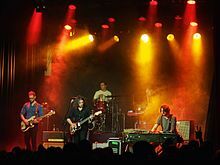 The band consists of Adam Granduciel (lyrics, lead vocals, guitar), David Hartley (bass guitar), Robbie Bennett (keyboards), Charlie Hall (drums), Jon Natchez (saxophone, keyboards) and Anthony LaMarca (guitar). Founded by close collaborators Granduciel and Kurt Vile, The War on Drugs released their debut studio album, Wagonwheel Blues, in 2008. Vile departed shortly after its release to focus on his solo career. The band's second studio album Slave Ambient was released in 2011 to favorable reviews and a lengthy tour which proceeded. The band's third album, Lost in the Dream, was released in 2014 following extensive touring and a period of loneliness and depression for primary songwriter Granduciel. The album was released to widespread critical acclaim and increased exposure. Previous collaborator Hall joined the band as its full-time drummer during the recording process, with saxophonist Natchez and additional guitarist LaMarca accompanying the band for its world tour. Signing to Atlantic Records, the six-piece band released their fourth album, A Deeper Understanding, in 2017, which won the Grammy Award for Best Rock Album at the 60th Annual Grammy Awards. In 2003, frontman Adam Granduciel moved from Oakland, California to Philadelphia, where he met Kurt Vile, who had also recently moved back to Philadelphia after living in Boston for two years. The duo subsequently began writing, recording and performing music together. Vile stated, "Adam was the first dude I met when I moved back to Philadelphia in 2003. We saw eye-to-eye on a lot of things. I was obsessed with Bob Dylan at the time, and we totally geeked-out on that. We started playing together in the early days and he would be in my band, The Violators. Then, eventually I played in The War On Drugs." Granduciel and Vile began playing together as The War on Drugs in 2005. Regarding the band's name, Granduciel noted, "My friend Julian and I came up with it a few years ago over a couple bottles of red wine and a few typewriters when we were living in Oakland. We were writing a lot back then, working on a dictionary, and it just came out and we were like "hey, good band name" so eventually when I moved to Philadelphia and got a band together I used it. It was either that or The Rigatoni Danzas. I think we made the right choice. I always felt though that it was the kind of name I could record all sorts of different music under without any sort of predictability inherent in the name"
While Vile and Granduciel formed the backbone of the band, they had a number of accompanists early in the group's career, before finally settling on a lineup that added Charlie Hall as drummer/organist, Kyle Lloyd as drummer and Dave Hartley on bass. Granduciel had previously toured and recorded with The Capitol Years, and Vile has several solo albums. The group gave away its Barrel of Batteries EP for free early in 2008. Their debut LP for Secretly Canadian, Wagonwheel Blues, was released in 2008. Following the album's release, and subsequent European tour, Vile departed from the band to focus on his solo career, stating, "I only went on the first European tour when their album came out, and then I basically left the band. I knew if I stuck with that, it would be all my time and my goal was to have my own musical career." Fellow Kurt Vile & the Violators bandmate Mike Zanghi joined the band at this time, with Vile noting, "Mike was my drummer first and then when The War On Drugs' first record came out I thought I was lending Mike to Adam for the European tour but then he just played with them all the time so I kind of had to like, while they were touring a lot, figure out my own thing." The lineup underwent several changes, and by the end of 2008, Kurt Vile, Charlie Hall, and Kyle Lloyd had all exited the group. At that time Granduciel and Hartley were joined by drummer Mike Zanghi, whom Granduciel also played with in Kurt Vile's backing band, the Violators. After recording much of the band's forthcoming studio album, Slave Ambient, Zanghi departed from the band in 2010. Drummer Steven Urgo subsequently joined the band, with keyboardist Robbie Bennett also joining at around this time. Regarding Zanghi's exit, Granduciel noted: "I loved Mike, and I loved the sound of The Violators, but then he wasn't really the sound of my band. But you have things like friendship, and he's down to tour and he's a great guy, but it wasn't the sound of what this band was." Slave Ambient was released to favorable reviews in 2011. In 2012, Patrick Berkery replaced Urgo as the band's drummer. On December 4, 2013 the band announced the upcoming release of its third studio album, Lost in the Dream (March 18, 2014). The band streamed the album in its entirety on NPR's First Listen site for a week before its release. Lost in the Dream was featured as the Vinyl Me, Please record of the month in August 2014. The pressing was a limited edition pressing on mint green colored vinyl. In June 2015, The War on Drugs signed with Atlantic Records for a two-album deal. On Record Store Day, April 22, 2017, The War on Drugs released their new single "Thinking of a Place." The single was produced by frontman Granduciel and Shawn Everett. April 28, 2017, The War on Drugs announced a fall 2017 tour in North America and Europe and that a new album was imminent. On June 1, 2017, a new song, "Holding On", was released, and it was announced that the album would be titled A Deeper Understanding and was released on August 25, 2017. The 2017 tour began in September, opening in the band's hometown, Philadelphia, and it concludes in November in Sweden. A Deeper Understanding was nominated for the International Album of the Year award at the 2018 UK Americana Awards. At the 60th Annual Grammy Awards, on January 28th, 2018, A Deeper Understanding won the Grammy for Best Rock Album. Granduciel and Zanghi are both former members of founding guitarist Vile's backing band The Violators, with Granduciel noting, "There was never, despite what lazy journalists have assumed, any sort of falling out, or resentment" following Vile's departure from The War on Drugs. In 2011, Vile stated, "When my record came out, I assumed Adam would want to focus on The War On Drugs but he came with us in The Violators when we toured the States. The Violators became a unit, and although the cast does rotate, we've developed an even tighter unity and sound. Adam is an incredible guitar player these days and there is a certain feeling [between us] that nobody else can tap into. We don't really have to tell each other what to play, it just happens." Both Hartley and Granduciel contributed to singer-songwriter Sharon Van Etten's fourth studio album, Are We There (2014). Hartley performs bass guitar on the entire album, with Granduciel contributing guitar on two tracks. Granduciel is currently[when?] producing the new Sore Eros album. They have been recording it in Philadelphia and Los Angeles on and off for the past several years. In 2016, The War on Drugs contributed a cover of "Touch of Grey" for a Grateful Dead tribute album called Day of the Dead. The album was curated by The National's Aaron and Bryce Dessner. ^ "Red Eyes" did not enter the Wallonia Ultratop 50, but peaked at number 41 on the Ultratip chart. ^ "Red Eyes" did not enter the Netherlands' Single Top 100 but peaked on the Netherlands' Single Tip Chart at number 1. ^ "Under the Pressure" did not enter the Flanders Ultratop 50, but peaked at number 2 on the Ultratip chart. ^ "Burning" did not enter the Flanders Ultratop 50, but peaked at number 6 on the Ultratip chart. ^ "Holding On" did not enter the Hot Rock Songs chart, but peaked at number 34 on the Rock Airplay chart. ^ "Holding On" did not enter the Flanders Ultratop 50, but peaked at number 10 on the Ultratip chart. ^ "Holding On" did not enter the Wallonia Ultratop 50, but peaked at number 35 on the Ultratip chart. ^ "Strangest Thing" did not enter the Flanders Ultratop 50, but peaked at number 14 on the Ultratip chart. ^ "Pain" did not enter the Flanders Ultratop 50, but peaked at number 24 on the Ultratip chart. ^ "Nothing to Find" did not enter the Flanders Ultratop 50, but peaked at number 9 on the Ultratip chart. ^ "The War On Drugs". Secretly Canadian. Retrieved 2013-05-12. ^ Greene, Jayson. "Q&A – Kurt Vile on His Favourite Bob Seger Song and the Neil Young Solo That Changed His Life". villagevoice.com. Retrieved 11 August 2012. ^ Band of the Week: The War on Drugs. Paste Magazine, June 15, 2008. ^ a b c Freeman, John. "Interview – Kurt Vile | The Line of Best Fit". thelineofbestfit.com. Retrieved 11 August 2012. ^ "Pop Headwound: [Interview] The War on Drugs". Popheadwound.blogspot.com. Retrieved 26 February 2012. ^ Breaking: The War on Drugs. Rolling Stone, August 6, 2008. ^ War on Drugs Sign to Secretly Canadian, Give Away EP. Pitchfork Media, March 20, 2008. ^ Review of Wagonwheel Blues. Prefix Magazine, June 18, 2008. ^ Power, Ian. "Kurt Vile: The extended interview". citypages.com. Retrieved 11 August 2012. ^ Parker, Chris. "The War on Drugs' Adam Granduciel finds himself anew while Lost in the Dream | Features". Nashville Scene. Retrieved 2016-03-04. ^ "Watch The War On Drugs perform "Arms Like Boulders" from Austin City Limits Festival". Thekey.xpn.org. 2012-10-14. Retrieved 2014-03-20. ^ "First Listen: The War On Drugs, 'Lost In The Dream'". NPR.org. 2014-03-09. Retrieved 2014-03-20. ^ "The War on Drugs Signs With Atlantic Records". Billboard. Retrieved 2016-03-04. ^ "RSD '17 Special Release: The War On Drugs – Thinking of A Place". recordstoreday.com. Retrieved 2017-05-03. ^ "The War On Drugs return with new song "Thinking of a Place"". Indscene ». 2017-04-28. Retrieved 2017-05-03. ^ "The War On Drugs Announced A World Tour". ^ Minsker, Evan (2017-06-01). "The War on Drugs Announce New Album A Deeper Understanding, Share New Song: Listen". Pitchfork. Retrieved 2017-06-01. ^ a b "The War on Drugs Plot Expansive Fall Tour". Rolling Stone. Retrieved 2017-05-08. ^ "Features | Escape Velocity | Sincerely Ambient: An Interview With The War On Drugs". The Quietus. Retrieved 2013-05-12. ^ "The War on Drugs discography". australian-charts.com. Hung Medien. Retrieved 28 March 2014. ^ a b c d e f g h "The War on Drugs discography". ultratop.be/nl/. Hung Medien. Retrieved 28 March 2014. ^ a b c d "The War on Drugs Wallonie discography". ultratop.be/fr/. Hung Medien. Retrieved 18 May 2018. ^ "The War on Drugs discography". danishcharts.com. Hung Medien. Retrieved 28 March 2014. ^ a b "The War on Drugs discography". dutchcharts.nl. Hung Medien. Retrieved 28 March 2014. ^ "The War on Drugs discography". swedishcharts.com. Hung Medien. Retrieved 28 March 2014. ^ "The War on Drugs discography". hitparade.ch. Hung Medien. Retrieved 28 March 2014. ^ "CHART LOG UK: NEW ENTRIES UPDATE – COMBINED SINGLES (200) Chart Date: 3.09.2011". Zobbel.de. Retrieved 2013-05-12. ^ Coscarelli, Joe (9 August 2017). "The War on Drugs Is Still Playing Rock the Old-Fashioned Way". New York Times. Retrieved 15 April 2019. ^ "British album certifications – The War on Drugs". British Phonographic Industry. Retrieved 15 April 2019. Select albums in the Format field. Type The War on Drugs in the "Search BPI Awards" field and then press Enter. ^ Caulfield, Keith (September 3, 2017). "Lil Uzi Vert's 'Luv Is Rage 2' Debuts at No. 1 on Billboard 200 Albums Chart". Billboard. Retrieved September 4, 2017. ^ "Goud En Platina - Albums 2018". Ultra Top. Retrieved 14 April 2019. ^ "Dutch album certifications – The War on drugs" (in Dutch). Nederlandse Vereniging van Producenten en Importeurs van beeld- en geluidsdragers. Retrieved 15 April 2019. Enter The War on drugs in the "Artiest of titel" box. ^ "The War on Drugs – Chart History: Adult Alternative Songs". Billboard. Retrieved July 20, 2017. ^ "The War on Drugs – Chart History: Alternative Songs". Billboard. Retrieved August 2, 2017. ^ "The War on Drugs – Chart History: Rock Songs". Billboard. Retrieved July 2, 2017. ^ "Billboard.biz". billboard.com. Retrieved September 16, 2017. ^ "Netherlands Single Tip Chart - May 10, 2014". Mega Charts. May 10, 2014. Retrieved August 1, 2018. ^ "Future Releases on Alternative Radio Stations, Independent Artist Song Releases – ..." All Access Music Group. Archived from the original on June 10, 2017. ^ "The War on Drugs – Chart History: Rock Airplay". Billboard. Retrieved July 20, 2017. This page was last edited on 14 April 2019, at 22:37 (UTC).